Remember this jumper from my last post? The size was supposed to be for a one year old, but it turns out it fits three month old Lily now. In fact, it could be a couple inches longer. My friend Rachel left a comment on that last post saying that a "one year old size" isn't really meant to fit a one year old baby. Sure enough she was right. It was hot out last Sunday when this pic was taken, so Lily is wearing it as a summer dress. Isn't she the most beautiful baby in the whole wide world? 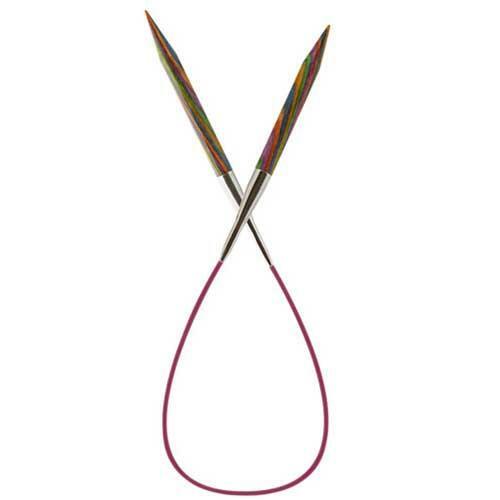 I wanted to mention I've fallen in love with Knit Picks Harmony Wood Circular Needles. My local yarn store just started carrying them, so I took them for a test drive. Oh my. Not only are they cool-looking with waves of color, they are lightweight, sharp, and seamless. I am really enjoying knitting in the round these days. Oh she looks so sweet in her knit jumper! Just beautiful! 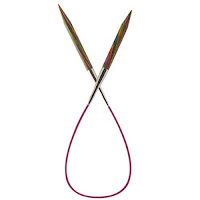 So, what's on your new circular needles? She looks lovely in the jumper! I think she is just beautiful! Sizing for baby wear is always an adventure! I love the jumper as a little summer dress. Thanks for the recommendation on the needles. I have their catalog in my basket and will have to see about ordering a set. I tried working with the bamboo yarn I have that splits so bad and realized my needles might be part of the problem. Precious baby in her little jumper:) I love it! This picture should be on a magazine cover! Enjoy your sweet day, HUGS! oh she is just adorable in that dress! Yes, she is the most beautiful baby! That is good to know about sizing. The good news is that she got to wear it right away!! 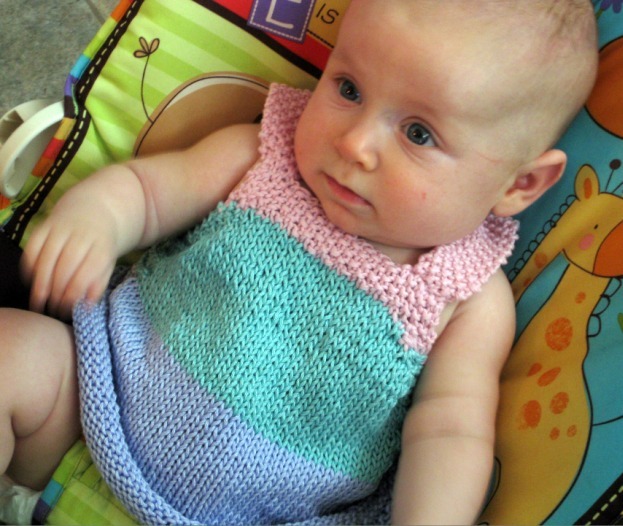 Lily looks so sweet in the little dress that you knitted!!! Thanks for showing a new photo of her. Yes, yes, yes she is! Lily looks totally adorable and glad she got to wear her jumper!